I write code while setting fears on fire w/ my pinky up. Fairly randumb. Often uncouth. Acquisitions Editor for @pluralsight publishing screencast tutorials for open source developers. I'm passionate about education, sailing, and snowboarding. 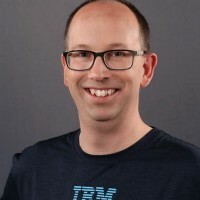 Christian, Husband, IBMer, Bluemix-er, author/blogger, minimalist/barefoot runner. Sola scriptura, sola fide. Tweets are my own, retweets != endorsements.